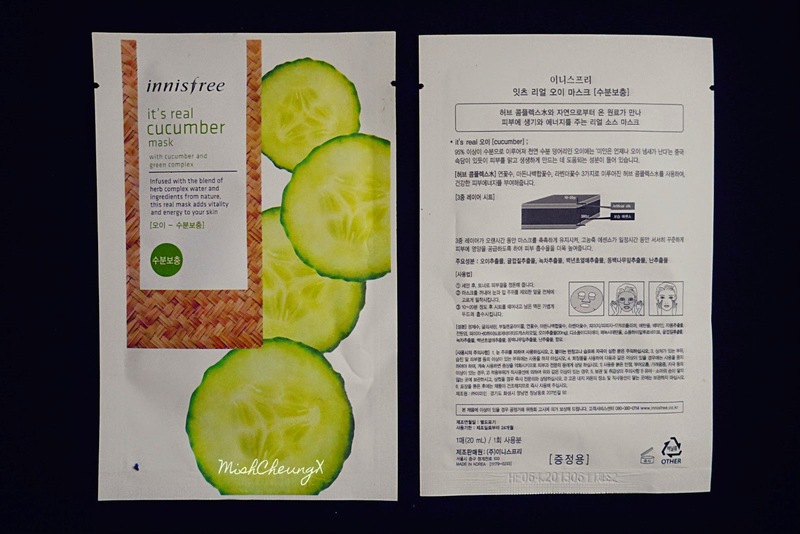 There are 16 variations of the Innifree It's Real sheet masks; each have slightly different functions, but all offer moisture, nourishment, radiance and renewal to your skin. 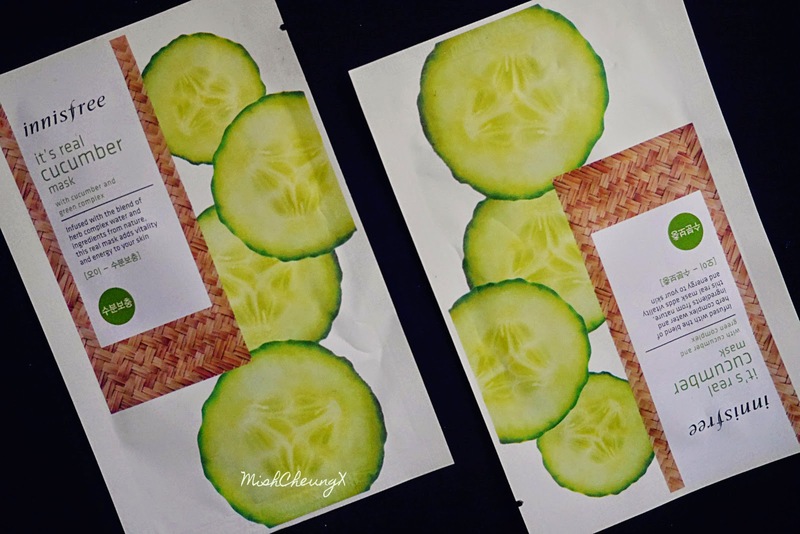 The cucumber mask's function is to mainly soothe, hydrate and refresh your skin. 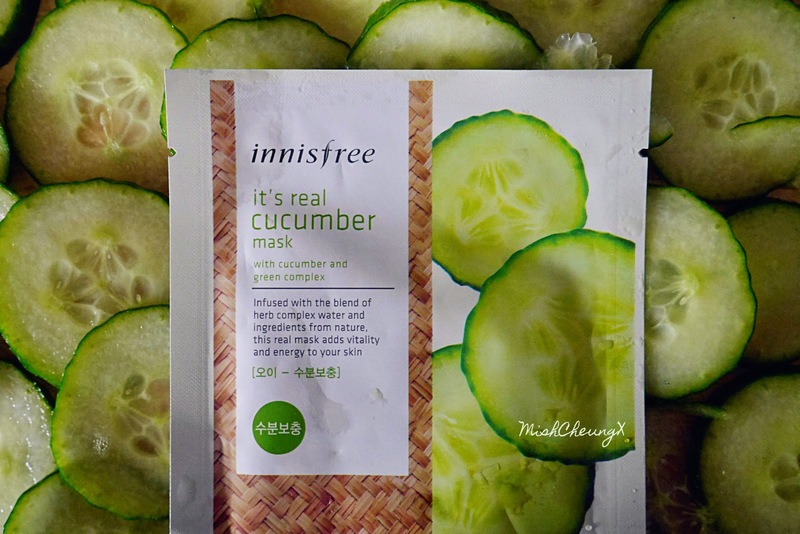 It contains cucumber extracts to make your skin clear and vital, as well as Jeju green complex to keep your skin healthy. Unlike other mask i've tried, this one was not lined with plastic. Be gentle when unfolding to prevent it from ripping. The mask has cutouts for your eyes and nose - great feature. It contains 20ml of solution, which is the perfect amount! No solution dripped when I was taking it out and there was very minimal left in the package. The scent is lovely~ theres a tiny hint of cucumber but it's more of perfumed floral scent. 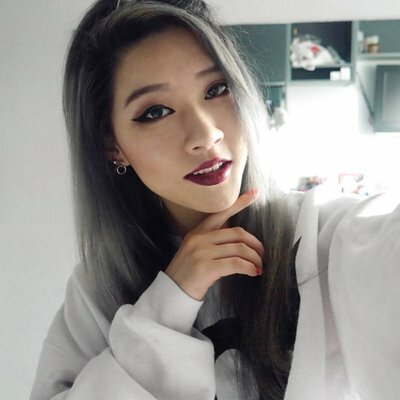 Would I recommend? : Indeed! A great treat all year round, refreshing during summer and hydrating during winter. It would work well before applying makeup and after a long day of work. I think this mask would be best suited for those with drier skin. I love the cucumber background! Reminds me to buy some face masks...I never tried one from Innisfree before. It looks really comfortable :D I really like Innisfree. You forgot to add that theres a hole for the mouth too :P ahahaha!